With it being the end of September, that means it's getting closer to Christmas and making Operation Christmas Child (OCC) boxes. This will be the second year that I have personally participate in this project. My mom has been doing it for several years and I've helped her with it. Since we live in a three story townhouse, there are a lot of stairs. All three sets of stairs all make their way to the main floor so gates where a must. 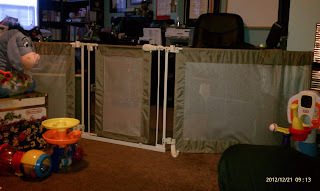 We first started putting gates at the top of the stairs going down to the entrance and the playroom. Once Michael started crawling, we put a gate at the bottom of the stairs going up to the third floor. 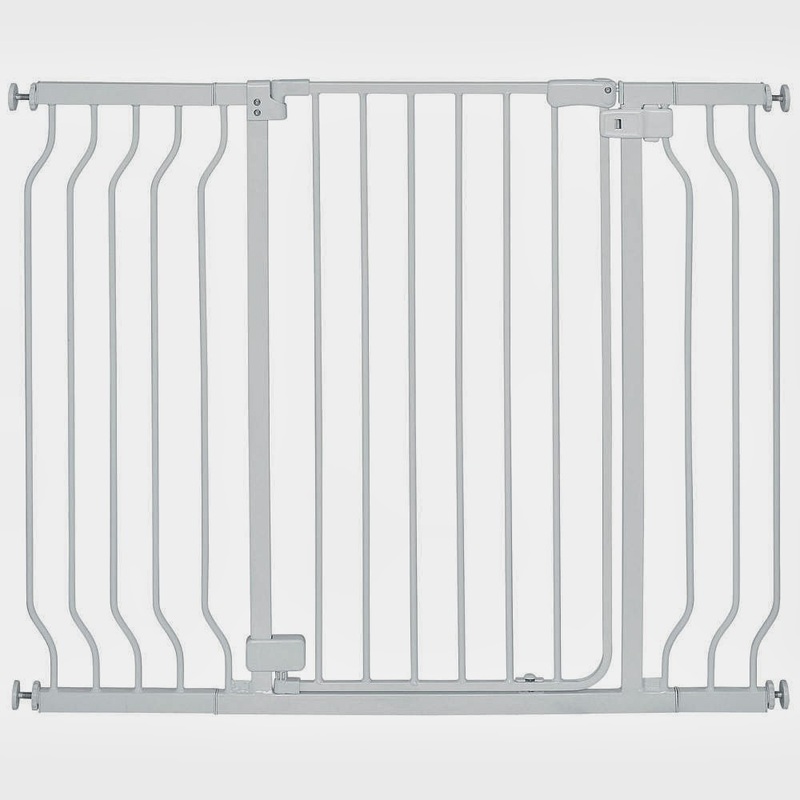 We actually are using two different types of gates. We originally used the Summer Infant Multi Use Gate for both of the stairs, but have since moved one of them else where in the house. 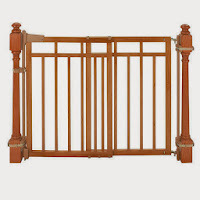 We now use the Summer Infant Stylish & Secure Deluxe Top of Stairs Gate with Dual Banister Kit for the entrance stairs and the stairs going to the third floor. 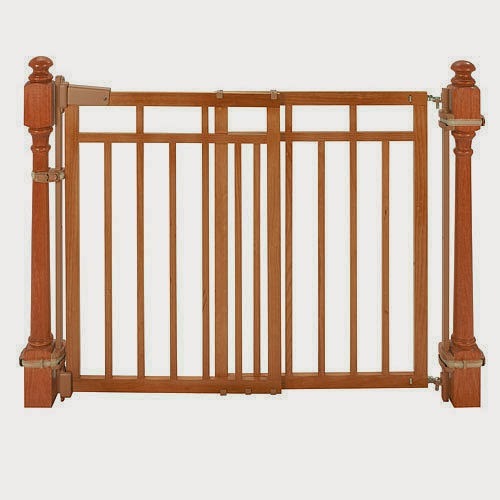 What we love about this gate is not only that we didn't have to drill our banister, but that you can just take the gate off to be able to bring in larger items up the stairs. Just like the play room, we covered all the outlets that where exposed with Safety 1st Press n' Pull Plug Protectors. For the coat closet and the half bath doors, we used Safety 1st Twist & Grip Knob Covers to prevent him from getting into them. He has recently learned how to take them off, but has left the closet alone and doesn't bother the half bath that much. We have two DVD storage units that have doors on them. One has two doors that have the knobs beside each other so we are using the Safety 1st Secure Tech Cabinet Lock. The other one has just one door so we're using the Safety 1st Lock Release Fridge Latch. The kitchen is the room that probably has the most "Micheal proofing" and it should, it is one of the most dangerous rooms in a house. For all of the lower cabinets and drawers, we use Safety 1st Complete Magnetic Locking System 8 locks 1 key. The only way that they can be opened is with the magnet key. Michael has tried to open them with the letter magnets with not luck. We have a lazy susan that the magnetic locking system doesn't work with. For that we use the Lazy Susan Cabinet Lock by Safety 1st. Michael, however, figured out how to open it within a few weeks of it being installed. For our oven/range we are using Safety 1st Oven Front Lock so that he can't open the oven and Safety 1st 5-Pack Clearview Stove Knob Covers to discourage him from messing with the knobs. The last thing that needed to be "Michael proofed" was the fridge. For that we use the Safety 1st Lock Release Fridge Latch. The only problem that we have is that Michael will sometimes climb up on to the counter, but not that often to make it worth putting locks on the upper cabinets. When we founded out that we were having a baby, I knew that I wanted to do a Classic Winnie the Pooh theme. 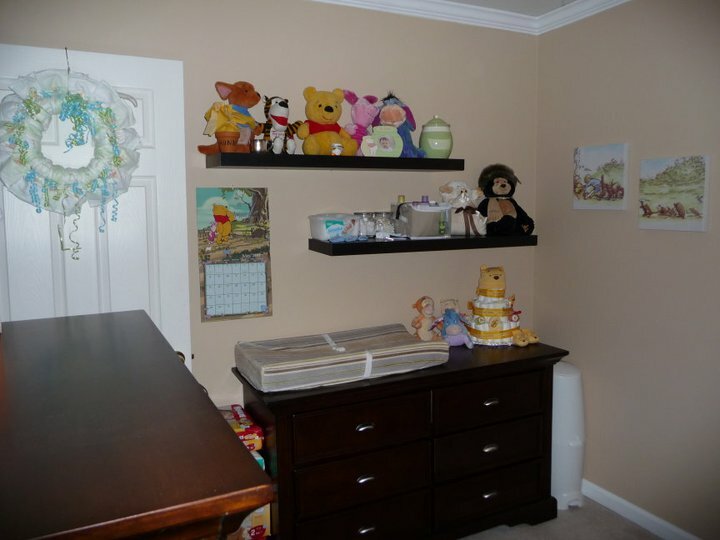 It was a perfect neutral theme and I absolutely loved the nursery set that was at Babies R Us at the time. We took longer picking out the furniture than the theme/bedding. We knew we wanted to get a convertible crib so that we didn't have to buy all new furniture once the baby grew out of the crib. We love the idea of the furniture growing with him and possibly being used for his baby. We also knew that we wanted something that was gender neutral and dark colored. I think, at the time, we didn't know what we were having so we wanted furniture that would be great for either gender. We had furniture picked out from the JC Penney baby catalog and furniture at Babies R Us. I remember it taking a long time trying to decided. We even asked our family's opinion and I had posted pictures on my Facebook page to see what my friends thought. We ended up ordering our furniture at Babies R Us. We chose the Babi Italia Hamilton Collection in chocolate. We were told a year ago that it was discontinued, but it's still listed on the Babies R Us website (click here to see it). When we were ordering our furniture, we noticed that the Classic Winnie the Pooh was being discontinued. My mother-in-law bought the light and my sister-in-law bought the valance and the wall decals. My husband and I went to every Babies R Us that was in a reasonable driving distance to find the bedding, wall art, blankets, and changing pad cover. We were able to get everything, but the full bedding set. One store had the heavy blanket still on display so we asked if we could buy it and they said that we could. Was sad to see the blue and gold go. 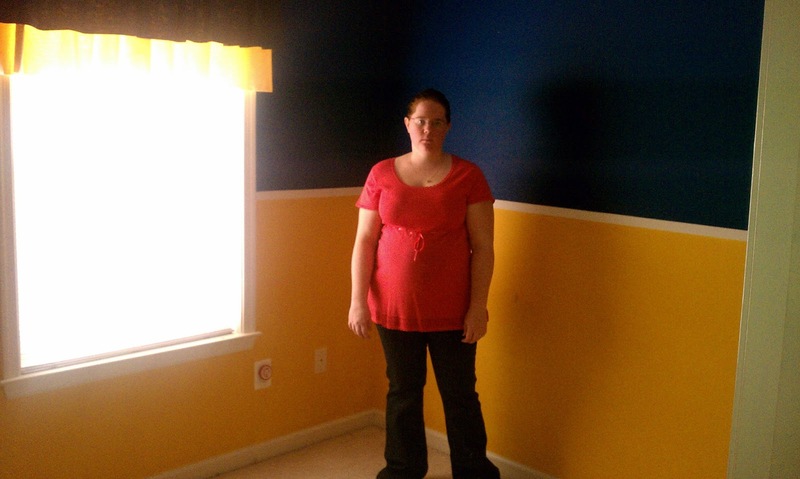 The room that we chose to become the nursery was our WVU room and was blue and gold. We bought a paint that had the primer mixed in with the paint. Helped save my husband time and did a great job covering up the deep blue color with just one coat (my husband did two coats just to make sure). After the painting was done, my husband and father-in-law installed crown molding. Looked like a completely different room. We then brought the furniture in and started decorating. We ended up using regular Winnie the Pooh bedding for the crib. 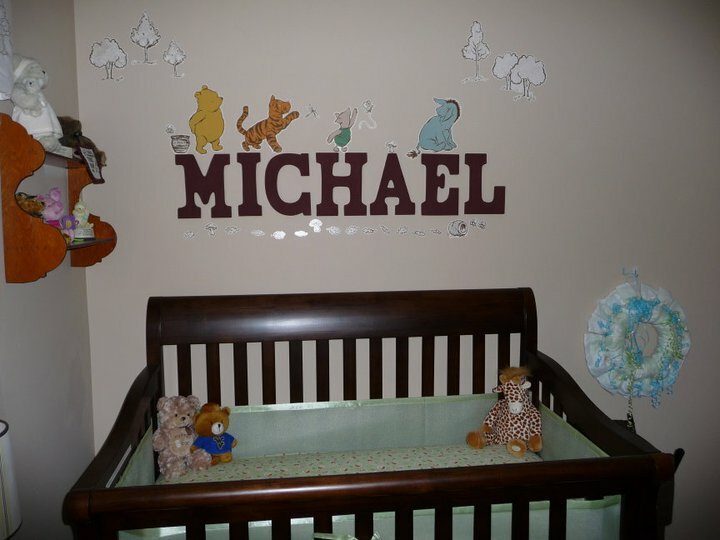 When we finally decided on a name, I went to Michaels and bought letters for his name to put over the crib. The letters were white so, I bought chocolate colored paint and painted each letter. I was originally thinking of putting baby Winnie the Pooh stickers on the letters, but decided against it so we could still use them after the theme had changed. I think we did a good job even though we're not real designers. I was sad to have to take it all down a few months ago. It's no longer a nursery. Even before I became a mom, I've always had a camera with me. I love taking photos. It's a great way of capturing the wonderful memories and keeping them forever. So, it's not really that strange to me that I have probably over 3,000 pictures of Michael already. It does help that I'm blessed to be able to stay with him and capture all these wonderful pictures. I also decided that I wanted to capture the age milestones professionally. The first one, we couldn't pass up on. He was only two days old and still in the hospital. We put him in the outfit that we were going to take him home in (a West Virginia University onesie). It was amazing how they took the pictures. Just put my pillows from my hospital bed to the foot of the bed, put a white bed sheet over them, and then placed Michael on it and started snapping away. The photography studio that took the pictures, posted them on Mom365.com so that we could share all the pictures with everyone. We placed our order the day after the pictures were taken and a few weeks later our pictures were in the mail. I will definitely do this with our next baby. 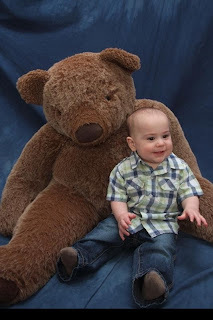 When I was home visiting my mom, I scheduled for Michael to get his three month pictures taken by one of my oldest friends who was working for PictureMe Portrait Studios (no longer open) in one of the local Walmarts. 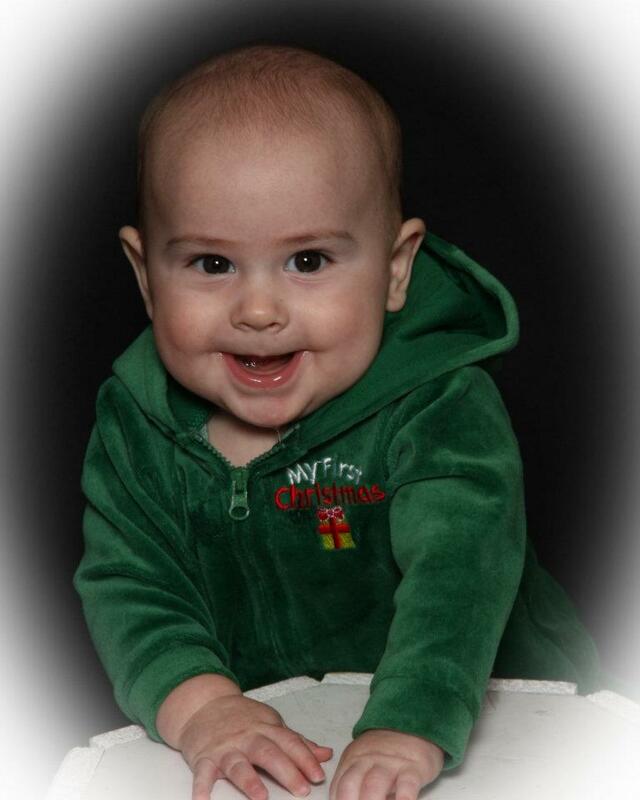 Had some adorable pictures taken. We even had a picture taken with him holding a football! I ordered a package deal that included a CD of all the pictures taken. Love those kind of packages - great way for everyone to see all the pictures taken. Since Michael's six months ended up around Christmas, we decided to do our first family pictures to put in our cards and Christmas pictures of just him. I scheduled them to be taken at PictureMe Portrait Studios in my hometown since we we're in visiting. This time, Michael just loved the camera and it was extremely difficult to pick which ones to have printed out. We also got them all on a CD so even though they aren't printed out, we still have them digitally. Everyone loved them - my mother-in-law had a hard time choosing which ones she wanted, that she had me make her a photo book of all that she liked. 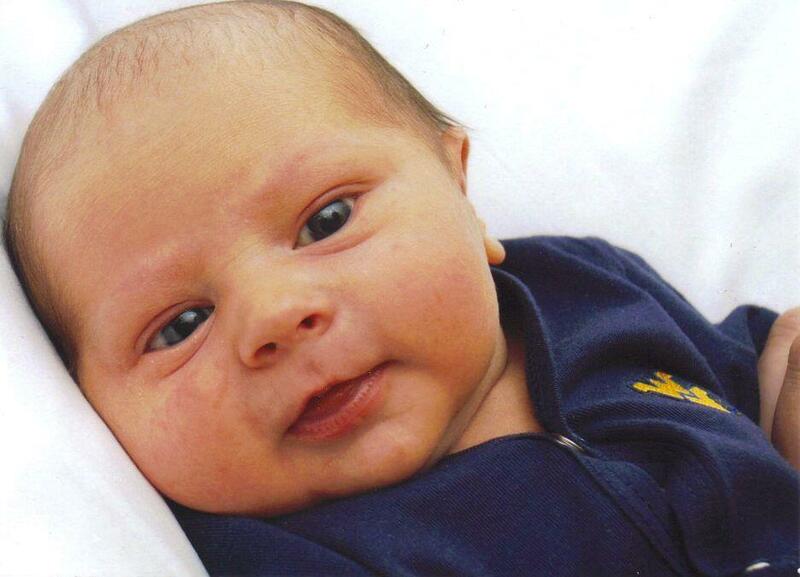 Michael was born at the perfect time, because nine months was around Easter. This time, we tried a photography studio (Portrait Innovations) near were we lived. I absolutely loved the place when we walked in and Michael seemed to as well. He was great and we got so many wonderful pictures. They had so many great props! I made my own package that included a CD of all the photos. One of the great things about Portrait Innovations is that they print your pictures right there and are ready for you within 30 minutes. 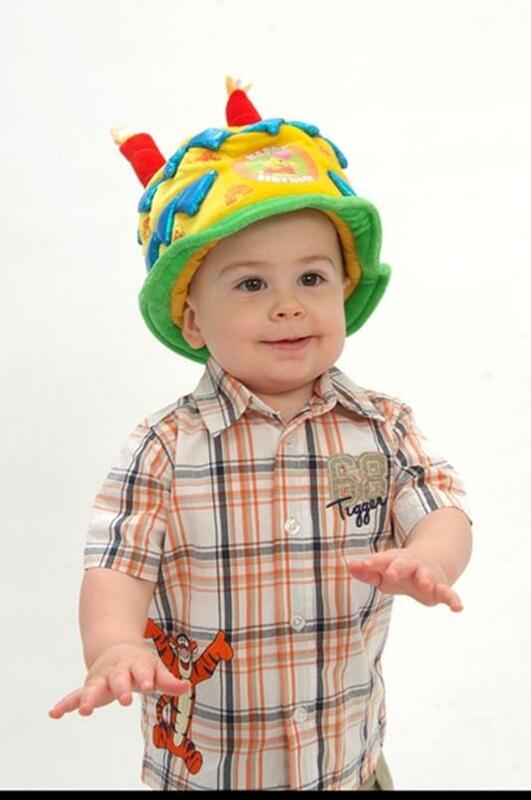 For his one year pictures, we went to Portrait Innovations here in town. We were lucky to have the same photographer and she did a great job, again! We didn't get nearly as many shots as before, but I think it was more because of the time of day they were being taken. I made a package that included a CD of all the photos. With our next baby, I'm not sure if I would go the same route. It was very pricey and most of the pictures that we had printed out weren't the ones that some family members wanted. Don't get me wrong, I'm very glad that we had them done, just wish that it didn't cost as much as it did. If I had a more professional camera, I would more than willingly take them. I've gotten some ideas on how to create a "studio" in your house and what kind of props that you could use (check out my Photography board on Pinterest). 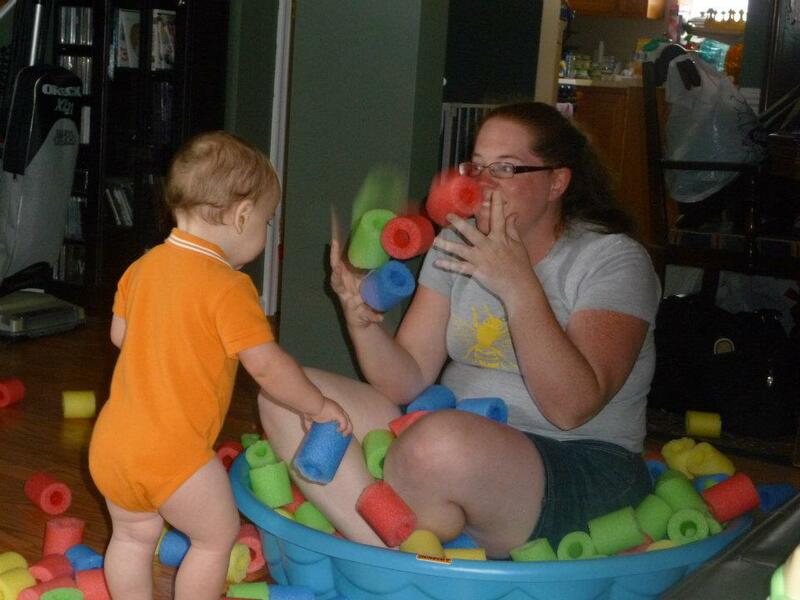 Another way I might go about doing this with the next baby, is by searching on Facebook for local photographers. I have found that there are great photographers out there that are not charging the amounts that a studio charges. We had family pictures taken at a local park last year by a photographer that I had found just by going to our local Chick-fil-a family night. She was taking pictures of the event for them. When they were posted up on our local Chick-fil-a's Facebook page, I knew I wanted her to take our family pictures. I was not disappointed with her at all. They're one of my favorite family pictures so far. She did a wonderful job with editing the pictures and put them all on a CD for us. No actual pictures were printed - only a CD. Just the way I like it! Everyone needs to have some type of emergency kit in their car. 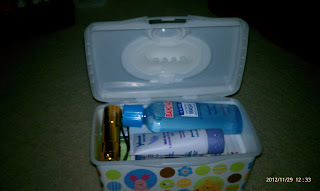 I had pinned this idea on Pinterest (Rips in My Jeans and One Good Thing by Jillee) and decided that I would make a kit for each of our cars and one for my mom and brother's as part of their Christmas gift last year. I took these two ideas, combined them, and geared them to my family needs. Since I had a child still in diapers, I had several empty wipe containers so no extra cost there. 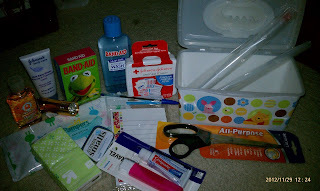 Most of the items were purchased at Target, some at Walmart, and at a reasonable price. Here's the list of everything that I put in and with some finagling, I did fit them all in. I actually had to open the one in my car up a few weeks ago to get a band-aid for my son. I like the idea of knowing I have stuff in the car if anything should happen while on a trip or not at home. I was put on bed rest three months before having Michael. 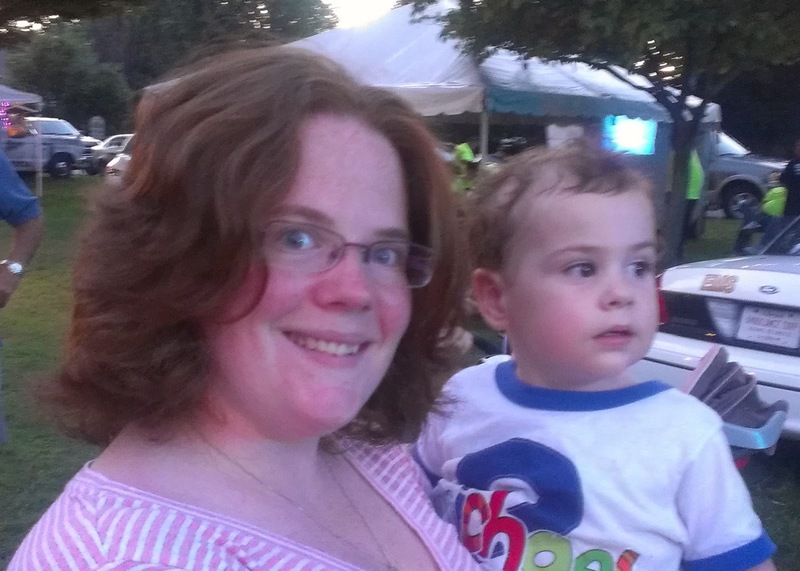 We had already decided that I would be a stay-at-home mom and were trying to get things financially set as best we could before being diagnosed with gallstones and being put on bed rest. So, since we didn't have that extra three months like we thought, we cut out all extra expenses that just weren't necessary (still kept Netflix so I had something to keep me occupied while my husband was at work). The first year and a half, I didn't really do much on trying to bring in income. Just spent my time taking care of Michael. I read blogs about ways people had made money from home and to be honest, some of the ways just weren't for me. 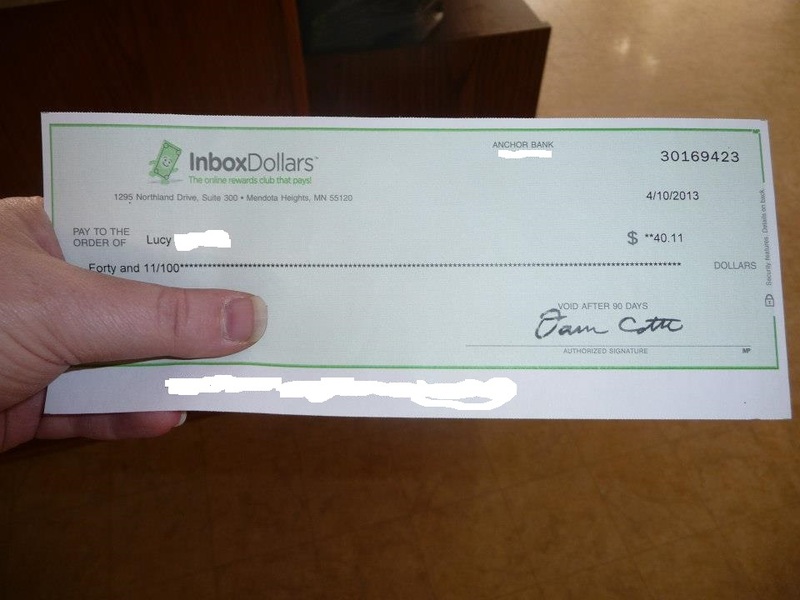 One blog suggested a website, Inbox Dollars. I checked it out and it really looked like something I could spend the time that Michael was napping on. I was earning about $40 a month, but summer came and it kind of went to the back burner. What I like about it is that you know upfront how much money a survey is going to make you, unlike other sites out there that you earn points and hardly ever know how much money you're really making. There's more than just taking surveys on there to earn money. 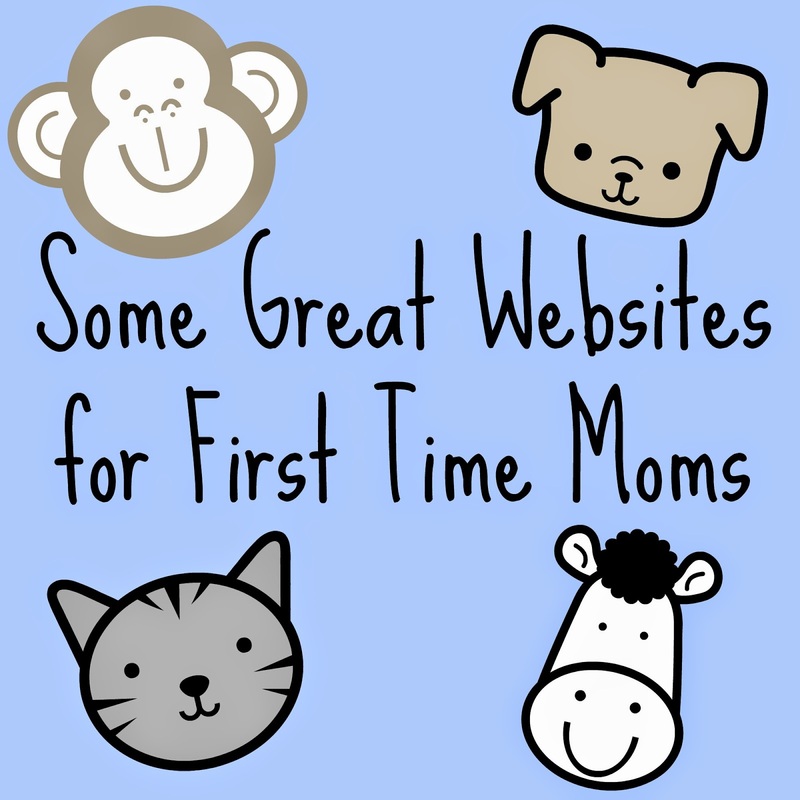 You can watch videos, play games, print coupons, and shop certain stores online through their website. 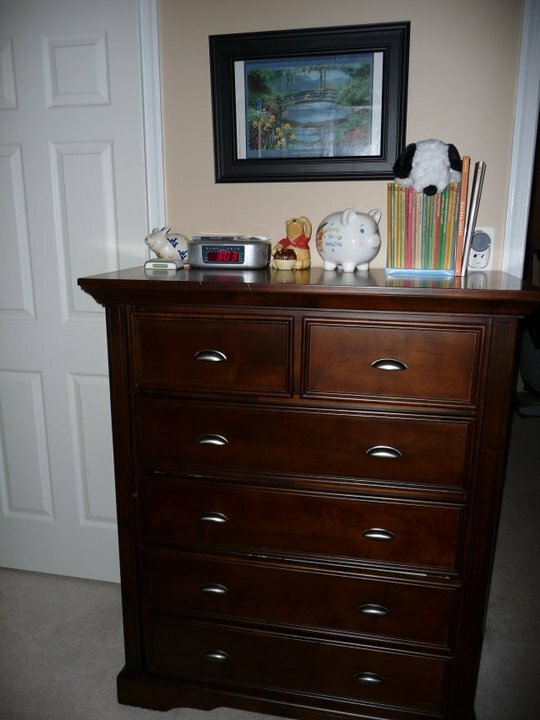 Another way that I have brought money in is by selling things via online yard sale pages on facebook. I've made more money doing this. I know that I could probably bring in more if I would sell Michael's clothes he's outgrown and his toys he doesn't play with anymore, but we plan to have another baby in a year or two and I don't want to have to buy new stuff. It's not that easy to sell on facebook, have to keep at it, but it's a great way to earn money and get rid of stuff that's just collecting dust in the house. I haven't made enough through this, but I have monetized my YouTube videos. From what I'm seeing, the more views on a video that's monetized, the more money you'll make. The same goes with writing a blog and earning money from it. This is what I've done so far. I know that it doesn't bring in much, but I would honestly rather do this than go and work a full-time job and putting Michael in daycare. I had completely forgot about a few other things that I've been doing. I use coupons as much as possible. I haven't been able to be as good as those people on Extreme Couponing, but I have saved some money doing that. We also watch how much we spend at the grocery store. Before we would just go in and get what was on the list, maybe more, and not even think anything about how much everything is going to cost. Now, we know how much we have to work with, a lot of times it's $30 a week, and bring up the calculator app on the cell phone and start adding each time we add something to the cart. A lot of foods taste the same no matter the brand so, we buy store brand most of the time. There's still those items, like Ketchup, that you have to go name brand on. I have downloaded an app on my Android cell phone, Ibotta. Haven't really used it because most of the offers are of items that we don't use. Sounds like a great concept - earn money grocery shopping. Still trying to figure it out. 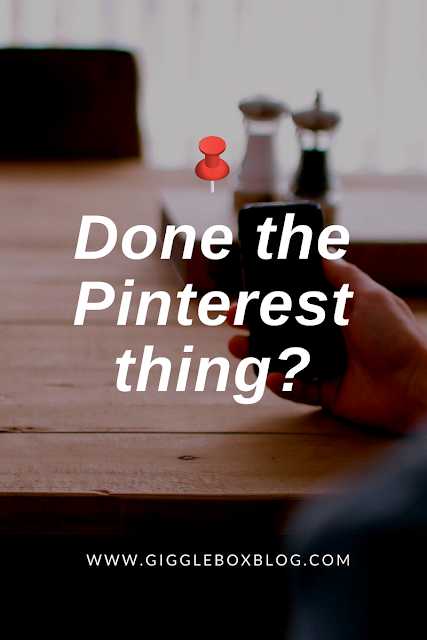 Another way I've tried, but have not been successful with is making slideshows for people. My first slideshow was for mine and my husband's wedding nine years ago. I have since done a slideshow for my husband's best friend's wedding, my sister-in-law's wedding receptions, a 50th anniversary party for my husband's grandparents, a 25th anniversary party for my in-law's, and first birthday parties for one of my nephews and Michael. I have been putting it out there on Facebook, but no luck. I charge $15 an hour. Depending on how many pictures and songs, it could take anywhere from two hours to five hours. I've had a couple people contact me, but have never gotten back to me after our first talk. 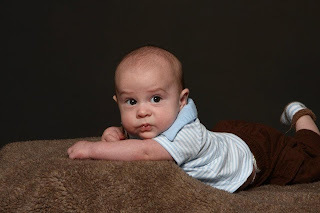 Since September is Baby Safety Month, I thought that I would write about all the ways that we have baby proofed our 3-story townhouse. We have started referring to baby proofing as Michael proofing because we've had to do more than some of our friends and family have done. Michael has always been a very inquisitive little boy. Always wanting to get into things and see how they work. Over the past year, he has also become a climber. When we first started looking into baby proofing, we went to Babies R Us. I was surprised at what all they had. Over the year and a half of Michael proofing, we have bought mostly all of the items from Babies R Us. Their selection is so much better than any home store out there. 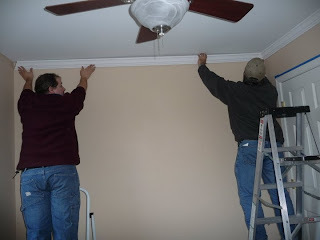 Since we have been Michael proofing our house for over a year now and our house is 3-stories, I'm going to probably do this as three different posts. One post for each level of the house. The playroom or "basement area" is not really a true basement since it's not underground. It leads out to the garage and the backyard. We have a bump out area that we use as a spare bedroom when needed, but mostly is were both mine and my husband's desks and computers are. We didn't want Michael to be able to get into our desks or mess with our computers as well as escape through the doggie door that went out into the backyard. 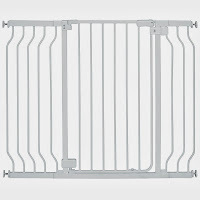 So, we bought the Summer Infant Sure and Secure Custom-Fit Gate. It allowed us to have a gate the size that we needed it to be and have a door to open for when our dog needed to go out to the bathroom. We absolutely love it. We also covered all the outlets that were not already covered by furniture with Safety 1st Press n' Pull Plug Protectors. Michael hasn't bothered with them that much in his playroom, but does know how to remove them. We've also used furniture/TV straps that we found at Walmart that are mounted to the wall to make sure that the TV and TV stand does not fall if Michael tries to climb it. (I don't remember the brand or the name of it or I would link it.) In the actual play area, there are four doors. One door leads out to the garage, another is a storage closet, another is the utility closet, and the forth is the half bath. We purchased Safety 1st Twist & Grip Knob Covers to try and prevent Michael from opening them. Here lately, he has figured out how to take them off of the door knob and open doors, but has left the doors on this floor alone. When Michael was smaller, we did put a plastic gate at the landing of the stairs so that he wouldn't climb the stairs and then possibly fall down them. The plastic gate doesn't work for him anymore. He knows how to take it down so, we don't put it up. He's great at walking up and down stairs so we haven't had any problems with him falling. 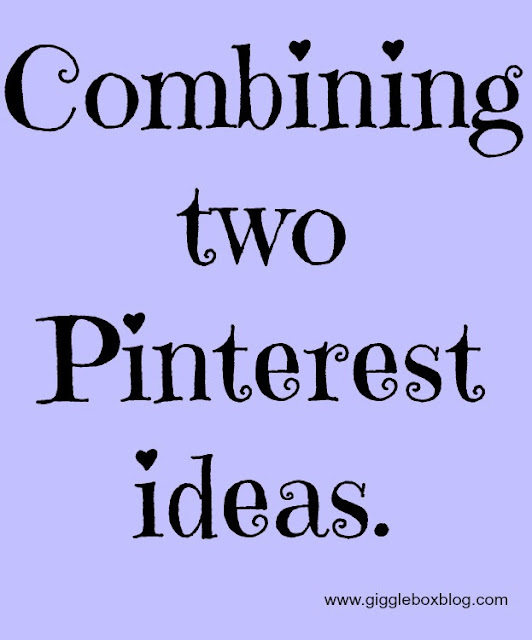 Last year after Michael turned one, I wanted to try and start doing some fun and cheap activities with him that I had found on Pinterest. They actually ended up not being fun to him. The first one that I tried didn't have a link to a blog to give instructions on how to do it, just a picture that was pinned with this in the description: "DIY Ball/Foam Pit for kids. 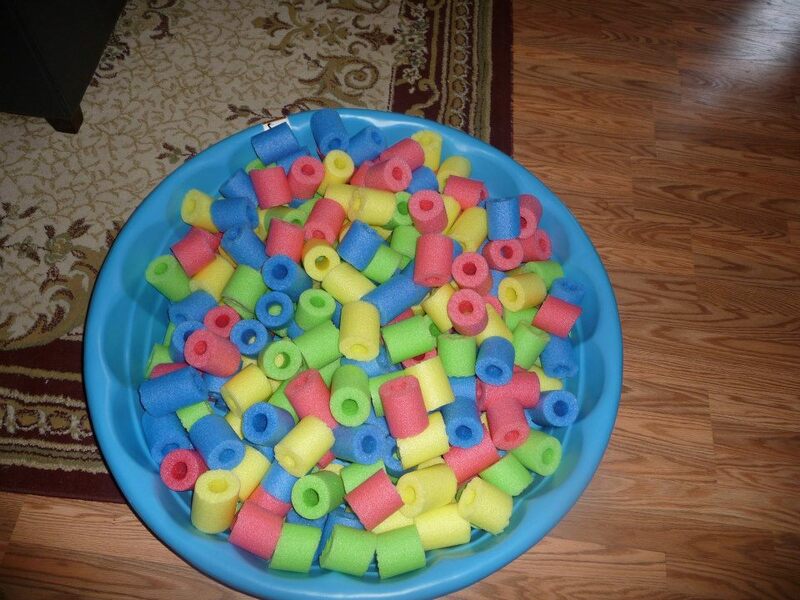 Small plastic pool plus cut up pool noodles! Less than $15." (Click here to see the pin) So, I went and searched for a kiddy pool at the beginning of August (bad time to look for one). Finally found one at Toys R Us. Pool noodles were a lot easier to find and they were on clearance - big win! 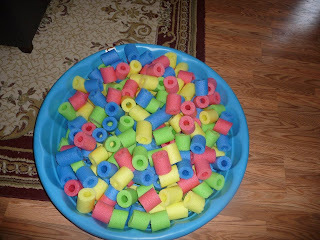 I bought twelve pool noodles and cut them up into smaller pieces. Walla, a cheap foam pit! Ended up getting in to get him to want to play in it. He seemed more interested in the pipe cleaners than putting them in the holes on the colander. 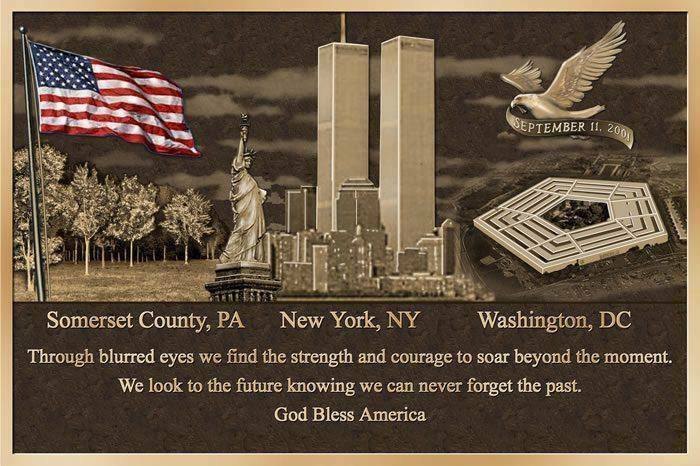 Amazing that it's only been 12 years since the attacks happened. I was living in Morgantown, WV attending West Virginia University when this happened. I had gone to my husband's (then boyfriend) trailer to pick something up that I had left there. When driving back to my apartment, I thought something was weird because the normal morning show wasn't going on and it was a familiar TV news caster's voice. I think at that time, only one tower had been hit. I went in to my apartment and turned the TV on to watch what was going on before heading to my class. I honestly don't remember much and was wanting to put what I had written in my online journal that day, but I deleted the journal years ago and the downloaded files of what I had written are not on the computer I'm working on. I do remember that the thing that got me and many of us that went to WVU, was the plane that went down in Somerset County, PA. That location was closer to us than Washington, DC or New York City. Now that I have a son, I want to make sure that he knows what happened. That four of our planes were taken and used as weapons to try and bring down America. That evil things happen even in our great country and that many brave men and women have fought to keep things safe for us. I know that my brother will probably tell him his story, that the whole thing was orchestrated by our own government and who knows, maybe some of it might have been, but no matter what thousands of innocent people died. They should never be forgotten. This was my baby shower cake from the family shower my mother-in-law threw for me in May 2011. The cake was made, of course, by Bing's Bakery in Newark, DE (they're her favorite bakery where she lives). Even though the tree, honey pots, acorn, ducky, and all the Winnie the Pooh characters were edible; we didn't eat them. 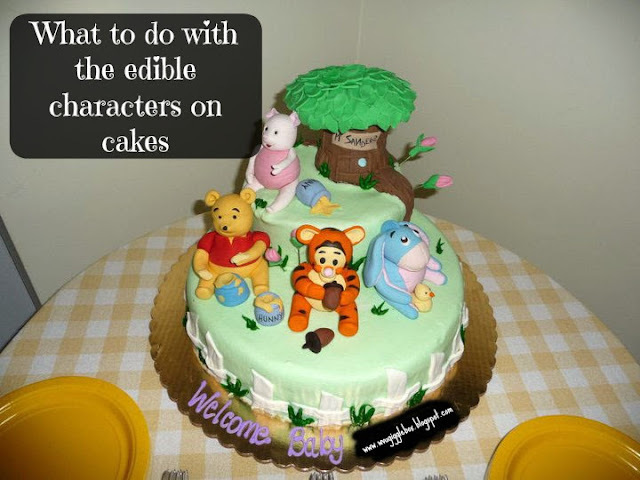 I mean, who could eat Winnie the Pooh? 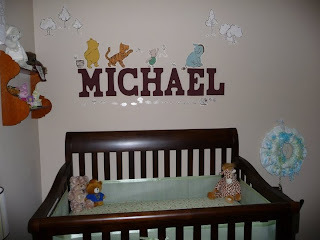 For Michael's first birthday, I wanted to be able to have his first year on display as a party decoration. I loved the idea of having a baby picture with its corresponding month hung on streamers that The Macs had done for their little guy's first birthday. So, I took the idea and gave it my own twist. Here's how I made our one year old Happy Birthday banner. 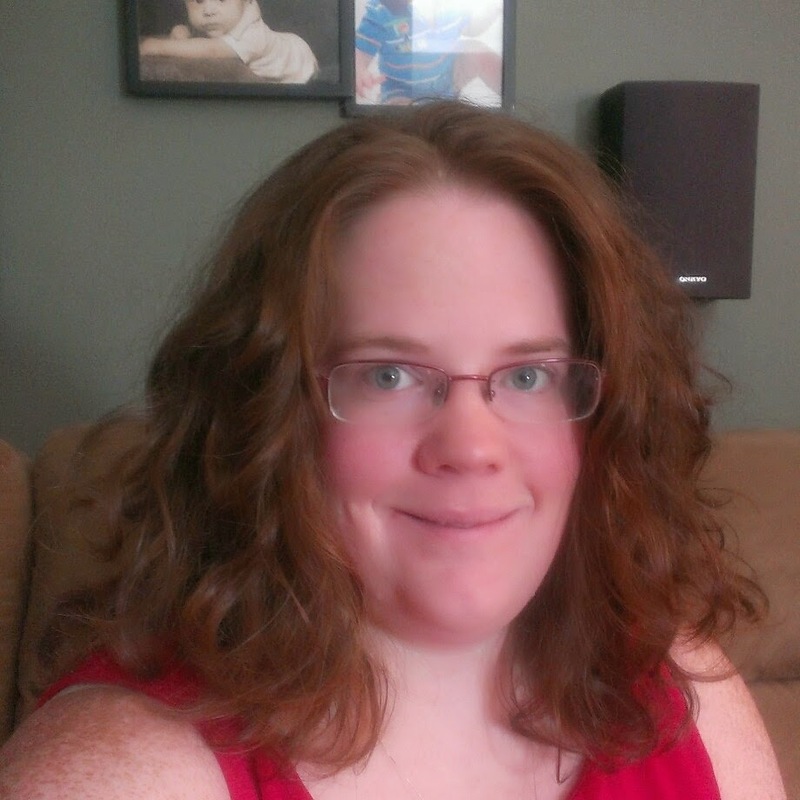 Two months ago I got my hair completely hacked off. I have really thick hair and when it gets as long as it did (not being cut in about a year), it becomes its own heater and really heavy. With it being the middle of the summer, I just wanted something that was cooler and easier to maintain. Another big reason for cutting so much off is that I wanted to help children who are going through a difficult time in their lives. I got a minimum of 10 inches cut off so that I could donate it to a very special organization, Locks of Love. Locks of Love helps children in the US and Canada who are in need of hair pieces due to long-term medical hair loss. Who wouldn't want to do this? I mean, you're already cutting your hair - why not give it to someone who could use it? The minimum amount of hair that they will take is 10 inches. I'm sure that the amount of hair that I send in will probably help out at least two kids, if not more. I turned in a ponytail about four years ago and received a nice card back from them thanking me for donating. 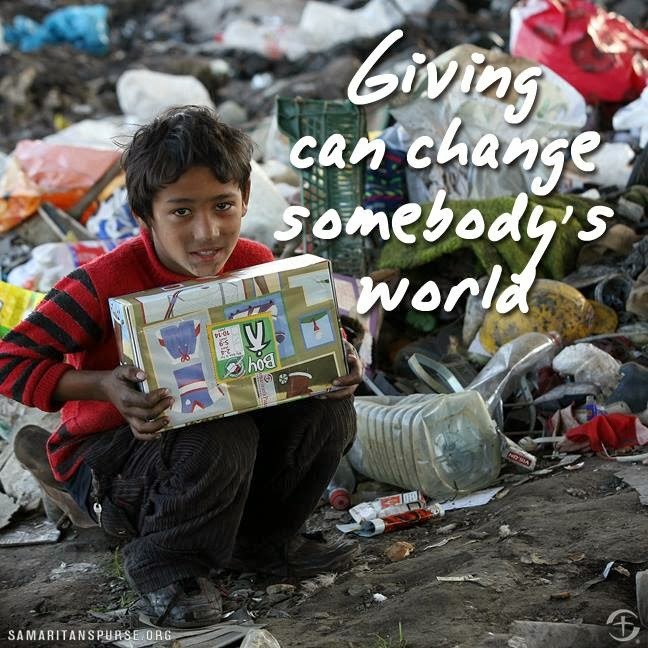 So, next time you're thinking about getting a lot cut off, why not donate it? It's simple. 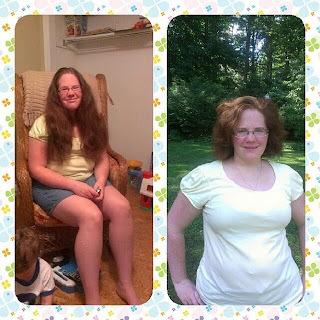 Just let your stylist know that you are planning on donating to Locks of Love. They'll know what to do. Once you get home, you need to go online to their website (http://locksoflove.org/) and fill out the Hair Donation Form to send with your ponytail.